5 steps to natural organic pest control. Eliminate poisons in your garden. There are mostly 3 kinds of pests that attack a garden. 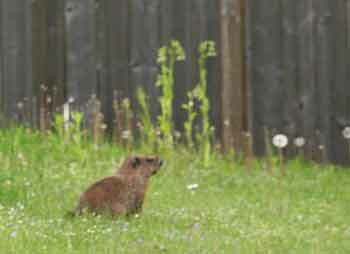 Animals such as deer, voles, squirrels, rabbits or groundhogs can really do a lot of damage very quickly. Insects such as aphids, japanese beetles, cabbage worms, tomato hornworm, squash beetles, asparagus beetles and many more are a common problem. Gastropods such as snails and slugs sneak up on you at night and can make lace out of your plants overnight. 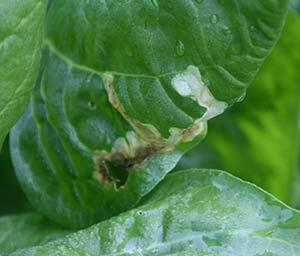 Occasionally there are soil borne pests such as nematodes that can do much damage. Most strategies used in natural pest control take a bit of time to have effect. In the long run they work much better than pesticides. STEP 1: Plant for success. The best pest defense is to completely avoid attack. How you physically set up your garden has a huge impact on how well it does. 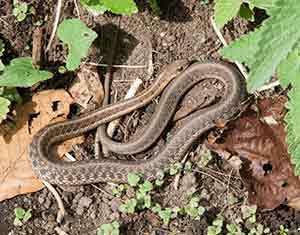 Some factors make your garden a welcome place for unwanted visitors. Conditions such as overcrowding, planting the same plants always in the same place so that pest populations can build up in these areas or choosing varieties that are prone to pest attack or placing your plants in the path of pests all invite trouble. Give your plants lots of space. This allows them to grow strong with less competition and makes the plants better able to resist attack and recover from damage. Good air movement helps prevent disease and allows good insects easy access to patrol your garden looking for pests to eat or for flowers to pollinate. Good spacing also allows you to easily inspect your garden and stop any problem before it gets serious. Rotate your garden regularly and avoid some plants completely if pests become too difficult to control. Some pests can build up if their favourite food is always planted in the same place. There are many plans for crop rotations and usually involve a 3 or 4 year period. ONIONS including garlic, shallots, leaks. POTATO FAMILY including tomatoes, peppers, eggplants. ROOTS such as Beets, carrots, celery, parsley and parsnips, I also put lettuce and plants that have a prominent taproot. There are many plans of rotation, the main idea is to keep plants of the same family away from areas where the same type of plant lived before for the longest possible period. Many harmful pests overwinter in the soil and come out in the warmer season. This is the case of squash vine borers and japanese beetles. Many harmful nematodes are also in the soil waiting safely for spring to start munching on your garden. By turning over your soil, you disturb these pests and expose them either to freezing/snow or to drying out. This can significantly reduce the numbers that come out in the spring. If you know that every morning the deer walk through the spot, or that there is a colony of groundhogs in the space, then planting a garden there is just inviting failure. Choose plants that are not attractive to pests. If the pests don't find anything they like they won't come. When you buy your seeds or plants buy pest resistant varieties if they are available. Deer resistant plants are a good example. You might consider planting fewer plants that attract pests if you can't get resistant varieties. If you know one plant is very attractive to your pests grow plants they hate alongside. Seed catalogues and packets as well as nursery labels will often have deer resistant icon indicating a less liked plant. Another example is the squash vine borer. It loves hubbard squash and zucchini but is fairly indifferent to cucumber and butternut squash. 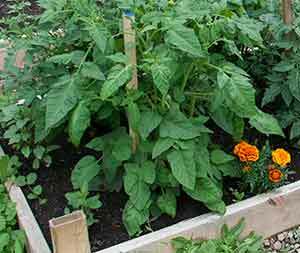 Companion planting is the practice of mixing different plants together. There are several benefits to companion planting. Large areas of only one plant type attract pests, it's better to have many smaller areas separated by different plants. 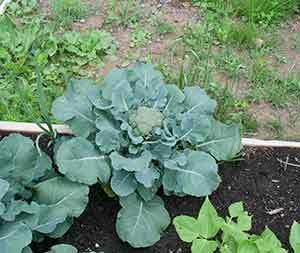 One cabbage among other non cabbage plants is less attractive and less visible than a large collection of easily spotted cabbage plants. Cabbage butterflies might overlook several single plants among other crops and not come at all. This has the effect of hiding your garden and allowing it to go under the radar of prowling insects looking for a place to mate and lay eggs. Some plants actually repel insects and some animals. This is the case of many of the strong scented herbs. Deer don't like aromatic plants and this can help keep them away. I planted my kale with basil and rosemary. Basil and oregano are good companion plants which keep many insects away, but the savories, rosemary and mints all help. Planting herbs along side your other plants is one of the best natural pest control strategy there is. Marigolds are also often planted for this purpose. They also look wonderfully cheerful. They also contain pyrethins which are naturally occurring insecticide. The tomatoes were planted with marigold and lots of basil. One of the tricks to reduce nematode damage is to plant a good crop of marigolds as one of the rotations. This significantly reduces nematode populations. French Marigolds are often cited as most effective but my experience is that any scented marigold will work just fine. Painted Daisy (Tanacetum coccineum )Also known as pyrethrum Daisy is said to kill root nematodes. Other plants actually attract good insects that eat the bad guys. Some of the herbs do this such as oregano, or dill. Marigolds repel many insects. They contain natural pyrethrins in varying levels. Sage in the Carrot patch helps keep carrot flies away. 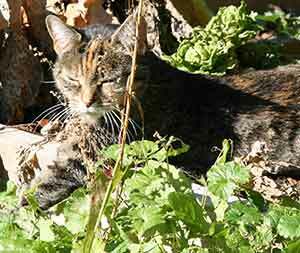 Most aromatic herbs such as rosemary and thyme work well as does catnip. Nasturtiums help keep cucumber beetles and aphids away. Voles also are not very happy with them. Basil and oregano are stars at attracting good guys to their flowers and repelling some bad guys. Garlic and Onions repel many pests and are delicious in their own right. I plant sets throughout the season to discourage slugs, mice, deer and many insects. Borage tastes bad to tomato hornworms. Garden pests such as grubs, aphids, caterpillars and slugs, are a great food source for many insects and birds. You want to encourage as many of these as possible. Just as the pests are looking for plants they like to lay their eggs and eat, predator insects are looking for other insects to eat. They are also looking for pollen and nectar. You want to encourage them as much as possible. Many good insects eat pollen as adults but have larvae that eat pests. This is true of many of the predator wasps for example. To encourage them plant lots of flowers around your garden or nearby. I have a large area of wildflower and it is alive with insects all summer. Many research projects have shown that fields that have wide rows of wildflowers around the perimeter of the field or strips of flowers within the crop area attract predator insects that provide a natural control of pests. 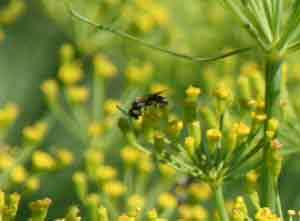 The same kind of plants that attract bees will attract lots of little wasps that want nothing more than to rid you of bad bugs. There are dozens of predator wasps that prey on insects, many are also valuable pollinators as well. I call them my assistants. When you see a wasp in your garden you can be sure that lots of bad guys are getting eaten. I once watched as a patrol of large black narrow waisted wasps busily carried away asparagus grubs. In a couple of days they completely cleared the grubs out of the plants. To encourage your predator insects do not spray pesticide that might harm them. It sometimes takes a few days for the predator insects to find an infestation but they will. The broccoli is free from any grub. It is planted with onions and not shown but there is a large bed of catnip behind it. Cabbage worms are a delicacy for insect and bird alike so you need to make it easy for them to come and pick them off. 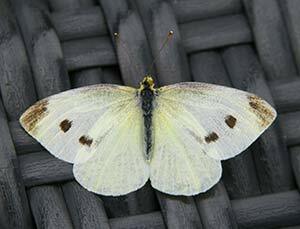 The cabbage butterfly are very common around here and flutter and dance around the garden all summer. At any given time there are dozens flying around and eyeing my cabbages. I can find eggs on the leaves of the plants every day but once they are hatched the caterpillars get taken away by my helpers. Birds can also be great allies to your fight against grubs and caterpillars. 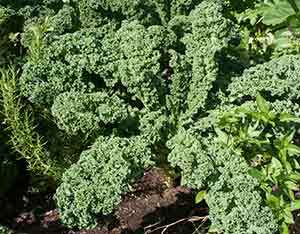 I grow a lot of kale, cabbage, broccoli and brussel sprouts. The birds keep them completely free of cabbage worms. It is not uncommon to see a bird sitting on a post patrolling the cabbage patch. In a bad year you might have to help the birds but when they find the source of worms they will keep coming back. This little guy just flew up from the garden with a beak full of cabbage worm. 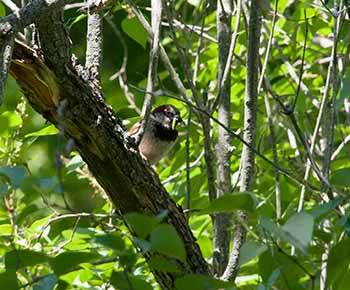 Some birds will attack small fruit, along with squirrels and just about everything else. Your best bet is to cover them with plastic mesh. I maintain bird feeders and this attracts many helpers to my garden. They come for the seeds and go on to the garden for the grubs. Another important group of my secret army of helpers are the spiders that live in the garden. You should encourage them actively. Many spiders don't make webs but actively hunt and catch insects. Because you don't see the webs they are sometimes hard to notice. I have lots of wolf spiders that are fabulous jumpers. They are amazing and even go underwater. The first 3 steps are passive steps, you set up good conditions and reap the benefits. If the good guys are slow in stepping in, you have to give them a hand. The next 2 steps are active steps. As I work in the garden I keep an eye out for any infestation that might have started and manually pick off the bugs. This is very effective for the larger caterpillars such as tomato hornworm, japanese beetles, cabbage worms, and slugs and snails. Slugs are particularly active at night and a night time expedition is sometimes very rewarding. Get a flashlight that you strap to your head such as a bicycle light and check under the plants. I get the odd slug in the brussel sprouts but they are not hard to pry out. Squash get a little grub that infects and eats the stem killing the plant or seriously weakening it. It is often possible to carefully slit open the stem, find the little rascal and take him out with tweezers. It also helps to wrap the stems in aluminium foil to prevent the insect from laying its egg on the stem, if you have this problem. It is possible to buy japanese beetle pheromone traps but opinions vary as to the usefulness. They certainly attract the beetles but sometimes attracts them from all around and brings them to your garden. I think they are useful if you already have a big infestation and they are coming already. You would rather attract them to traps than to your plants. Spectracide HG-56901 Bag-A-Bug Japanese 1 Count Beetle Trap, Pack of 1 If you decide to use the beetle trap, put it far away from your garden so the beetles are attracted away from your plants. Japanese beetle grubs live underground where they can eat off the roots of plants and kill them, and can do a great deal of damage. Small animals often dig for them causing damage themselves. I have skunks that work on the japanese beetles in the spring. 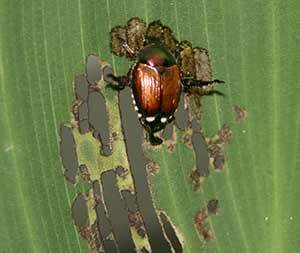 It's a balance as to whether you prefer japanese beetle damage or lawn damage. The hose is also useful to wash off large areas covered with aphids. if you get a large infestation you sometimes have to get them off before they damage your plants. Your helpers will eventually take over. 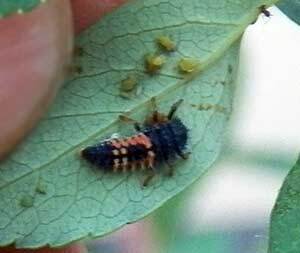 I've found that ladybugs are attracted to aphids and in a short while will arrive and lay eggs that hatch in voracious larva that soon rid you of aphids. Some insects lay their eggs inside leaves and the growing caterpillar just grows between the surfaces of the leaf. These can be squished in place. I get them on my swiss chards. A couple of minutes of pinching the caterpillars makes quick work of controlling them. In a bad infestation you need to remove the infected leaves. Because the grub is inside the plant it's hard for your helpers to get to them so these will mostly be your job. Some of the caterpillars that live in my garden are butterfly caterpillars and I often choose to let them eat instead of getting rid of them. I'd rather the butterfly than the garden plant. I also maintain a small area away from the garden where I can move some of the nicer butterfly caterpillars. 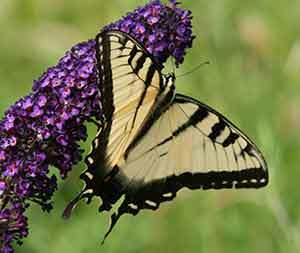 One of my favourite caterpillar and butterfly is the Swallowtail. 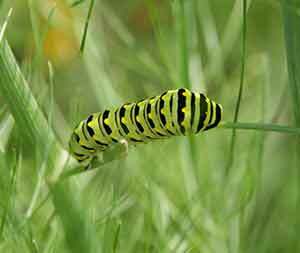 The caterpillars settle on fennel, queen anne lace, parsley and dill. I have a special fennel spot where I encourage them to live. This is one "pest" I don't remove. I like the butterfly more than the fennel. When I started my garden I had a lot of voles. In a couple of cases the only way to keep the little guys from eating the plants was to plant them in a mesh pot with a high rim. I made these and they worked really well. It was a nuisance to dig out the plant at the end of the season. I think it would work best for a permanent plant that is not going to move or be dug up at the end of the summer. Another member of the mouse control team, Tilley is taking a break. During the summer she valiantly patrols the garden for voles. It's her first stop in the morning. Luckily she is not interested in birds and loves voles. REPELLENTS: repellents can be very effective. There are countless recipes for hot pepper or garlic sprays that taste bad. Typically you blend in very hot peppers or garlic in a couple of cups water, let it sit overnight and strain the juice into a gallon or so of water and spray this to make the plant taste bad. This works for some mice, deer and rabbits. It also works for some insect pests. Sometimes the recipe also adds a bit of soap or dish detergent to boost the effectiveness. Many of the deer repellant add a couple of eggs to the mix and many people swear by them. There is at least one commercial repellent that is based on rotten eggs. Nothing works absolutely and much depends on conditions and how hungry the animals are. Commercial orchards and gardens sometimes use tankage to repel deer and other animals. It is the putrefied waste from slaughterhouses. Any rotting meat/water would do. The smell is effective. Small containers containing tankage, or rags soaked it it are suspended from the ground, and refreshed occasionally. There are dozens of tips to deal with slugs. From attracting them in beer, grape juice or orange slices and then disposing of them. Many people have suggested eggshells and sharp gravel to make the path around the plants more difficult to access. Many of the coffee shops will give their used coffee grounds for use in the garden and many animals dislike the smell. Strong smell from cheap perfume or strong scented soap also works for some animals. Try Irish Spring pieces and replace them occasionally as they air out. Blood meal is sold as a fertilizer for the high nitrogen content. It is also an effective way of keeping squirrels out of your garden and also helps keep voles out. I can vouch for its effectiveness keeping squirrels and mice away from freshly planted peas and tulip bulbs. Another very effective repellent is animal urine. Small animals such as voles, rabbits and groundhogs are afraid of predators and stay away from areas that smell like them. Fox Pete Rickard's Red Fox Urine Hunting Scent, 16-Ounce and coyote urine Leg Up Enterprises 91215 Real Coyote Urine, 16-Ounce are commercially available and a small amount goes a long way. I have sprinkled used kitty litter (without poop in it) around my garden raised beds and they completely eliminated any voles from the area. I've also heard but not had the need to try, that human male urine will also act as a critter barrier. Catnip has been shown to be an insect repellent and has been used to keep mosquitoes away. I've used catnip as a mulch. Diatomaceous earth is widely used both as a repellent, insects and slugs don't much like walking over it, and as a insect killer. It works by puncturing the pest causing it to dehydrate and die. 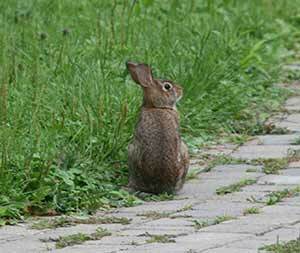 Another way to repel animals from your garden is to use a motion activated water jet. Hoont™ Powerful Outdoor Water Jet Blaster Animal Pest repeller - Motion Activated - Blasts Cats, Dogs, Squirrels, Birds, Deer, Etc. Out of Your Property It is quite effective for some animals although not for raccoons. They don't mind the water very much. BARRIER: In the last while a new type of slug barrier has become available. Copper is an effective repellent for many gastropods. Many boat bottom paints have copper in them to prevent marine growth including zebra mussels from covering the bottom. Copper tape,Tokky Copper Foil Tape EMI Shielding Guitar Slug and Snail Barrier 5CMx10M foil and mesh are all available. By circling the plant and creating a collar or barrier the slug will not cross the copper to get to the plant. You can try using a copper pot scrubbie opened up and stretched to see if this works for you. TRAPS: I've already mentioned beer and grape juice to attract and drown slugs but there are many pheromone traps that attract insects and either kills them or traps them. 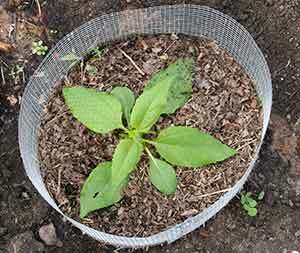 Typically the trap is placed near a fruit or plant that needs protecting. The insect is attracted to the trap and does not go to the fruit. Another trap that is very effective in controlling earwigs is simply a number of 6 inch pieces of old garden hose scattered in the garden. Earwigs love the little caves and you can go around in the morning and empty out the earwigs into a bucket of water. Astonishing numbers can be removed this way. If possible avoid pellets and baits or sprays that poison the insect or slug. You want to avoid contaminating your garden with anything poisonous. You don't want to kill the good insects or birds either. I don't think it is possible to have a completely pest free garden. The good predators have to find the infestation and react and that takes some time. Or you have to have time to build the fence or squish the bugs. What we lose in production yelds we make up in benefits. A balanced ecosystem, no poisoned food, beneficial insects preserved and lowered costs are only some of the plusses. If you have an infestation of soil borne pests, such as squash vine borer, or Japanese beetles, or fusarium wilt or nematodes, your garden might benefit from Soil Solarization. It is particularly effective for organisms found in the upper 6 inches of soil. The process is simple. Turn over the soil and smooth it out. Water thoroughly. Cover with thin clear plastic. Let stand for 6-8 weeks. Not only will many pests, pathogens and weeds have been killed but there is no harmful residue and the process is very simple. I have a page describing the process of Soil Solarization in detail. When you have a severe infestation and the bad guys have broken through the usual defenses, you need a helping hand, there are several alternatives open to you. You can purchase predators suited to your problem. Ladybugs, Praying mantises and Nematodes are 3 stars in the natural control arsenal. 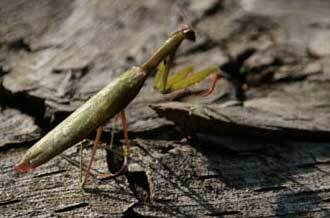 Another insect that can be brought into your garden to help is the Praying Mantis. The Praying Mantis is a fabulous insect that can control many pest species. They should be encouraged and left unmolested if you have them naturally. We have them here but I have not seen them very often. They are shipped as egg capsules which hatch within 3 or so weeks and release 200-300 little hungry praying mantises. Praying Mantis egg cases. They are not as immediate as ladybugs but once they are there, they work hard. A third live helper, is the Nematode. Nematodes are a class of worms which include many species of parasitic worms. The ones being sold are harmless to humans and animals and are targeted to soil dwelling and wood boring and other insects. Nematode mixture. Nematodes are claimed to be effective against several hundred insects including Japanese beetle, squash vine borers, termites, ticks, adult and larvae flea, and lots of garden pests. Some are effective in the ground and some above ground. They get mixed in water and sprayed used a hose attachment. Ladybugs, Praying Mantis and Nematodes are shipped live and should be handled carefully. You want them to be alive and kicking when you release them. If you buy them from a garden store, they should be refrigerated. There are a few insecticides which are of natural origin and can be quite effective. One is pyrethrin which controls a wide range of insects. Pyrethrin. is generally considered quite safe except for fish. It is a poison and needs to be handled carefully. It has the advantage of quickly being broken down being biodegradable. In fact follow the instructions carefully otherwise it will not be very effective. It is often combined with diatomaceous earth. It is extracted from a type of Chrysanthemum. In order to avoid poisoning bees, it is recommended that it be sprayed on in the evening to avoid spraying bees. DO NOT CONFUSE with permethrin which is much more toxic and resistant to breakdown. Cats can get very sick near it. Use only natural sourced material rather than synthetic. Coyote urine helps keep deer and small animals away. Fox urine works for small animals. Some plants make good companions. Basil comes in many varieties. Great for keeping the bugs away but also delicious. Here is herb garden seeds. Copper tape and mesh works to stop slugs. They don't like walking over it. Natural insect control sells insects that you release in your garden for natural pest control. Sustainable pest regulation in agricultural landscapes. Scientific article from US National Library of Medicine. 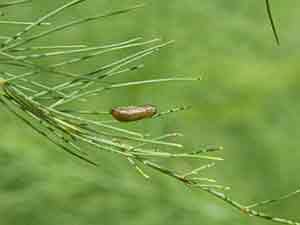 Biological control and natural enemies of Invertebrates Articles on natural control of garden pests from the University of California Agriculture and Natual Resources. Natural Products for Managing Landscape and Garden Pests in Florida A good read no matter where you are. From the U of Florida IFAS extension. These painted daisies are said to repell and kill nematodes. This information is for general knowledge. There are many strategies for a natural pest free garden. These are the steps that have worked for me. This article is intended as entertainment.